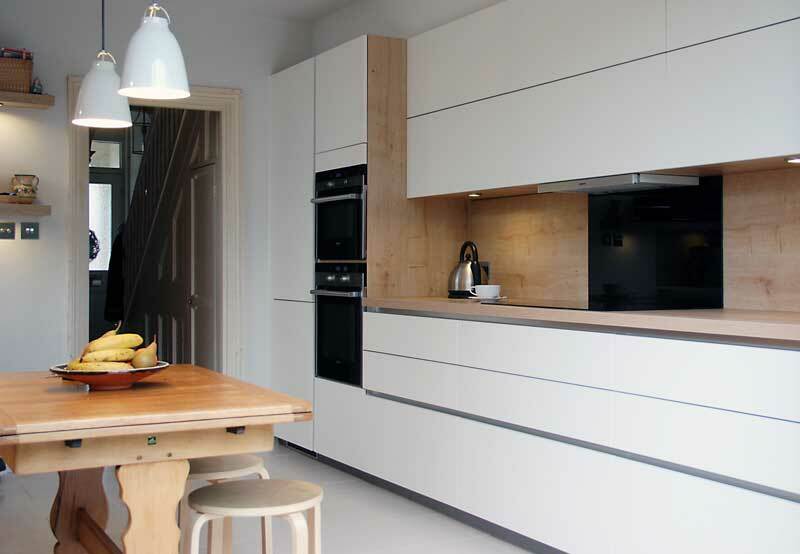 Our client had their heart set on adding bi-folding doors to the end of their white satin kitchen. The existing layout was an L-shape with a small door to the right hand side leading to the garden. The plan was to let the light flood in, opening up the space to the outside. 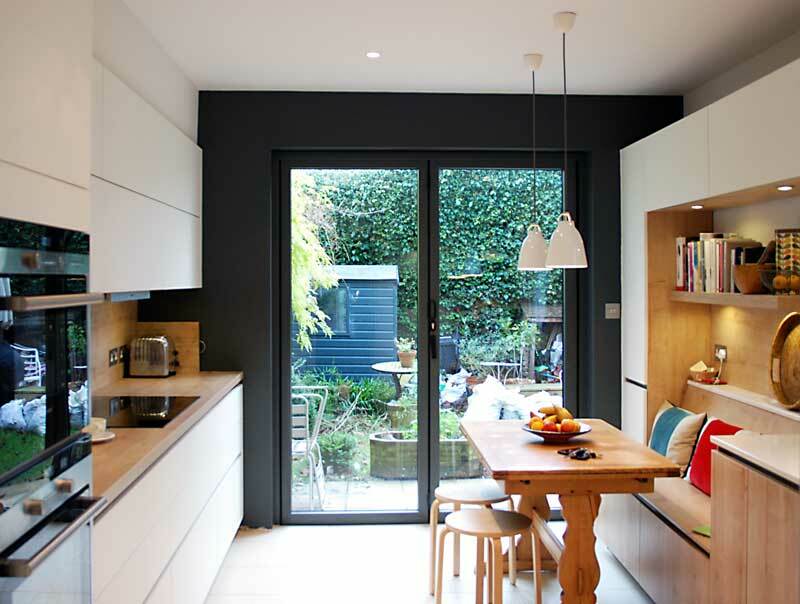 In terms of the kitchen brief we had to find a way to conceal the boiler, have seating for four adults, house a full height fridge-freezer, washing machine, dishwasher, two ovens, large induction hob and plenty of storage for a young family. 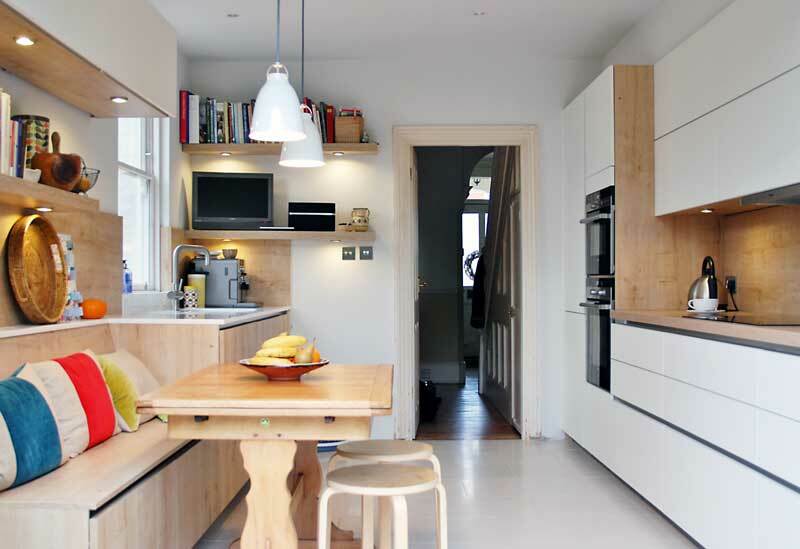 The feel of the kitchen had to be young, fresh and just a little bit quirky. They wanted something that really caught their imagination and justified the major structural rejig. The key element is the seating area and the wrap-around units. This set the tone both in style and the colour scheme; the soft satin white sitting very comfortably alongside the Cornwall Oak, inviting a very easy interplay between the two finishes. The right hand side houses the built in fridge freezer and oven units, with super practical drawers running the entire length of the base unit run. 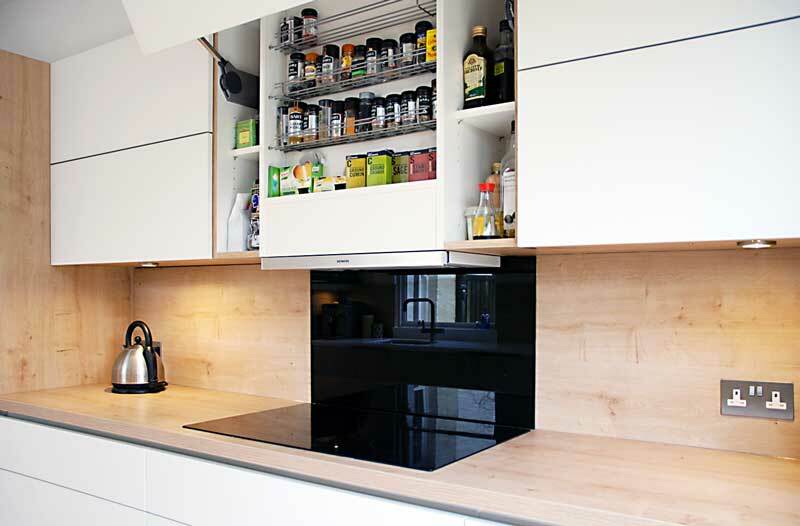 The bi-fold wall units add further storage, whilst one hides the telescopic extractor and another conceals the boiler. The sink area is compact but very functional, topped with quartz for a truly family proof ‘wet zone’. 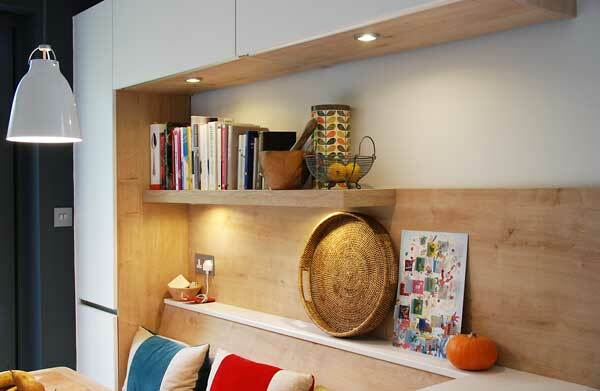 Big, chunky shelves were used to soften the edges and add space for family life and all that comes with it. 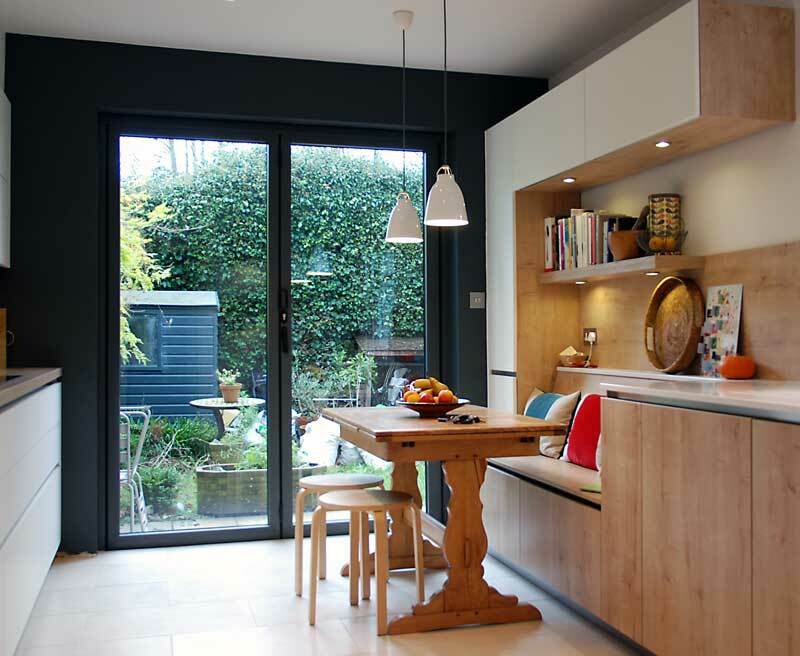 This kitchen is not the biggest we have done, not by a long way, but it is right up there in terms of style, practicality and, just as importantly, the way it makes you feel. It’s a space that feels right, it’s both glamorous and yet homely, modern but still a little bit rustic. It’s a pretty special mix. The seating area looks great set against the wooden shelves with the soft, warm lighting. 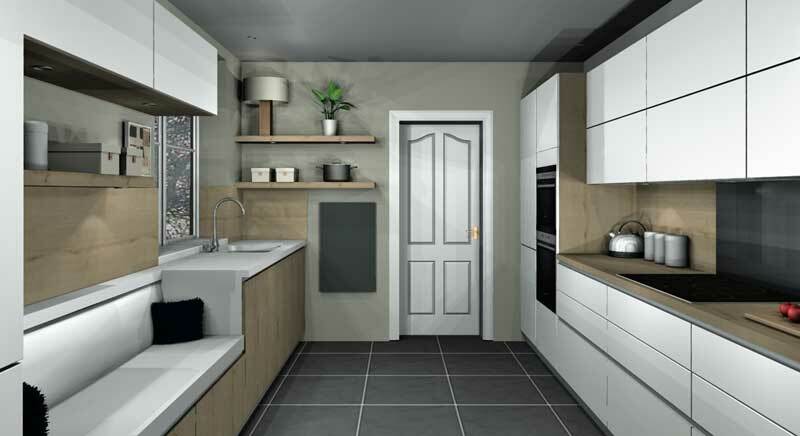 The simple lines, the practical layout coupled with a little bit of creativity show perfectly how you don’t need to have the biggest kitchen or even the biggest kitchen budget to end up with something a little bit special. We think this one really hits the spot.